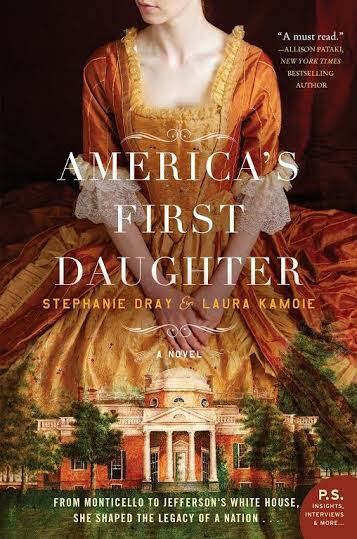 We are absolutely thrilled to bring you the Blog Tour for Stephanie Dray and Laura Kamoie’s AMERICA’S FIRST DAUGHTER, a historical fiction novel is published by William Morrow, an imprint of HarperCollins, and releasing March 1, 2016! AMERICA’S FIRST DAUGHTER is a compelling, richly researched novel by bestselling authors Stephanie Dray and Laura Kamoie. Drawing from thousands of letters and original sources, the authors reveal the fascinating, untold story of Martha “Patsy” Jefferson Randolph, Thomas Jefferson’s eldest daughter. Patsy was one of the most influential women in American history: not only the progeny of a founding father – and the woman who held his secrets close to her heart – but a key player in the shaping of our nation’s legacy. And her story is one seldom told, until now. Make sure you grab your copy today! 1) Tell me about yourselves. We’re two friends, history nerds, and bestselling writers who had the crazy idea to write a book together! While Steph has written numerous award-winning works of historical fiction, this was Laura’s first, though she has written numerous novels of genre fiction and was a full-time historian and college professor until just a few years ago. 2) What was it like working as a writing team? How does it differ from writing on your own? What were the challenges? How did you overcome them? Would you do it again? Having never worked together before, everything could have gone disastrously wrong. Both of us have our own writing voices; we have strong opinions and we are both used to having creative control. We also have vastly different working styles. But we had a few things going for us. The first, and most important, was profound mutual respect. We didn’t often disagree on the crafting of the book, but when we did, we would explain our positions, and ultimately come up with a third solution that was better than anything either of us could come up with on our own. Brainstorming together we could almost always build upon one another’s ideas in such a way that it was a pure joy. There were many times one or the other of us would say, “Wait, wait, what about this!” And then we’d both gasp. For us, writing fiction together–sharing the research, hashing out the historical controversies and interpretations, choosing a cohesive point of view–has been a challenging but rewarding experience unlike any other. We loved it so much that we decided to do it again with our forthcoming MY DEAR HAMILTON about Elizabeth Schuyler Hamilton, the wife of Secretary of the Treasury, Alexander. 3) Tell me about your book. America’s First Daughter? America’s First Daughter is an epic family saga that focuses on the relationship between Martha “Patsy” Jefferson Randolph and her famous father, Thomas Jefferson. Their tight bond was forged by the death of Patsy’s mother, who Thomas Jefferson loved dearly. For almost her whole life, Patsy was her father’s constant companion, and she devoted herself to protecting him, no matter what sacrifices, secrets, or sins that required. 4) How did you bring this real life historical character to life? How did you make her your own but remain faithful to the real woman? One of the most important things about Patsy was that she and her children edited Jefferson’s enormous collection of letters, so almost everything we know about our third president is what she wanted us to know. So that’s where we started. With the letters. We read them, then tried to piece together what that letter would have meant to the real woman. What episodes of her life it might call to mind. What might have been involved in deciding not to burn a letter but to let it pass to us. Sometimes we felt like we were channeling a ghost when we would predict some happenstance only to dig into the research and find out that it was true. The thing that made it so possible to bring Patsy to life was how relatable her feelings, decisions, and experiences were, even when they weren’t fully sympathetic. Everyone can understand the need to take care of a parent, protect your family, and do whatever it takes to keep those you love safe–and that’s the heart of Patsy’s story. 5) Is there anything else you would like to share with readers? Reading this book will not only help shed light on the past, but also on the present. What Jefferson did–or in some cases, more importantly, what he didn’t do–shaped our nation. And those choices are still impacting the world we live in today. But the book is also a love story, a murder mystery, and a cracking read with juicy twists and turns to sink your teeth into!